Nik Wallenda, member of a celebrated family of professional daredevils, has completed a tightrope walk across Niagara Falls in a televised stunt. 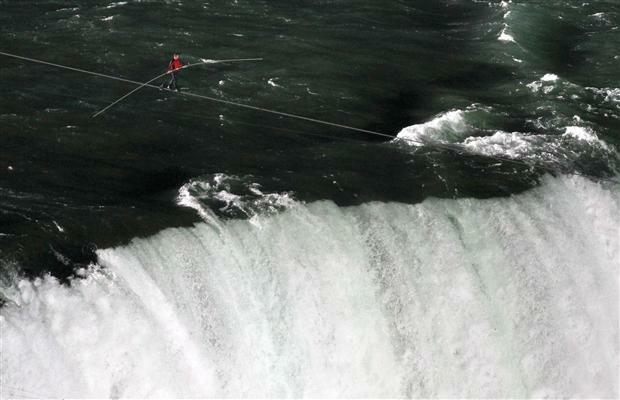 Nik Wallenda braved wind and heavy spray to make the 1,800 ft (550 m) walk from the US to Canada on a 2-inch (61 mm) wire. Thousands watched from Goat Island, where he began the crossing, suspended 150 feet (46 metres) above the falls. It is the first such feat over Niagara Falls in over a century. Nik Wallenda is the seventh generation of the famed Flying Wallendas. The family has performed for more than 200 years, including the signature act that gave the group their name, where two pairs of performers walk the wire, each supporting another aerialist on a pole. Those two aerialists, in turn, carry a pole upon which the seventh member of the troupe balances in a chair. The family has suffered two deaths from falls while performing, including Nik Wallenda’s great-grandfather in 1978. Nik Wallenda, 33, wore a safety harness attaching him to the wire, a precaution insisted on by ABC, the US broadcaster which sponsored the live broadcast of his walk. Prior to the walk, he said he had not performed with a harness before, but that it would not take away from the event. After he arrived, Nik Wallenda was asked to hand over his US passport to officially enter Canada. The daredevil had estimated the total cost of the walk would be around $1.3 million, including creating and installing the steel wire, as well as permits and security on both sides of the border. Legal liability had prevented ABC from funding all of Nik Wallenda’s costs and materials, so he had taken to online site IndieGoGo to raise further funds. As of Friday afternoon, Nik Wallenda was 45% of the way towards his goal of $50,000.